Be it capped by snow in winter or set against a lush green background in summer, nothing is as symbolic of Kyoto as Kinkaku-ji's golden reflection shimmering across the rippled surface of the pond before it. Not even the crowds of tourists  and they come by the thousands  can detract from Kinkaku-ji's undoubted splendor. The current gold leaf-coated reconstruction was unveiled in 1955, five years after the 14th-century original was torched by one of the temple's monks. 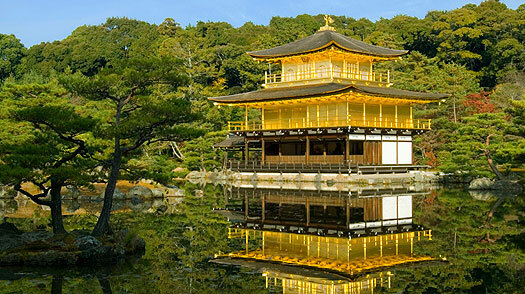 Kinkaku-ji is open daily from 9am to 5pm. Admission is ¥400. Take bus numbers 101 or 205 from Kyoto Station to the Kinkaku-ji Michi bus stop. If you are coming from another part of the city, you can also take the number 59 and 12 buses to the Kinkaku-ji Mae bus stop. Kyoto Guide: Find travel deals, hotels and more!